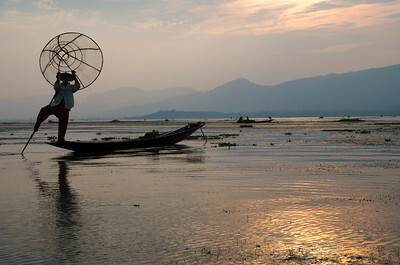 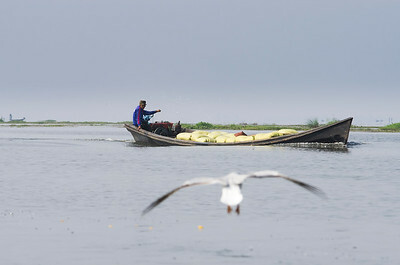 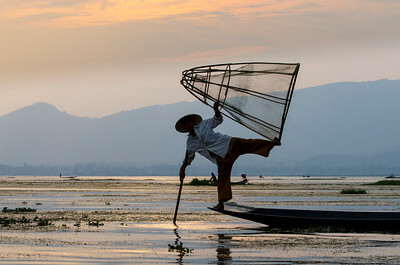 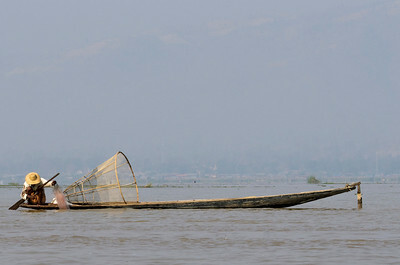 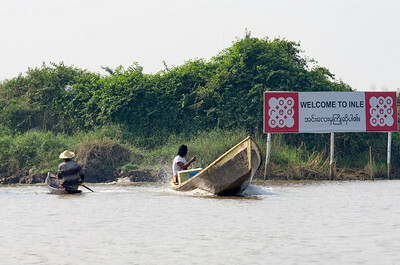 Inle Lake (အင်းလေးကန်), is a freshwater lake located in the Nyaungshwe Township. 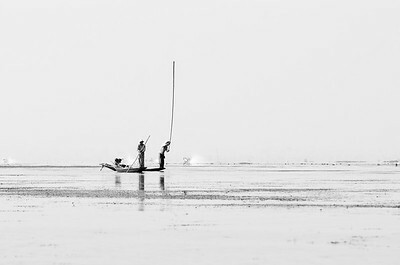 It is the second largest lake in Myanmar with an estimated surface area of 116 km², and one of the highest at an elevation of 880 m. During the dry season, the average water depth is 2.1 m, with the deepest point being 3.7 m, but during the rainy season this can increase by 1.5 m.
The people of Inle Lake (called Intha), some 70,000 of them, live in four cities bordering the lake, in numerous small villages along the lake's shores, and on the lake itself. 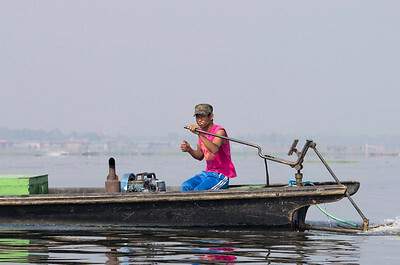 Transportation on the lake is traditionally by small boats, or by somewhat larger boats fitted with single cylinder inboard diesel engines. 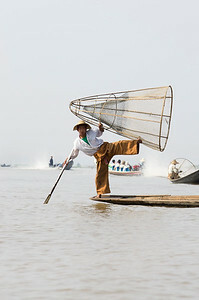 Local fishermen are known for practicing a distinctive rowing style which involves standing at the stern on one leg and wrapping the other leg around the oar. 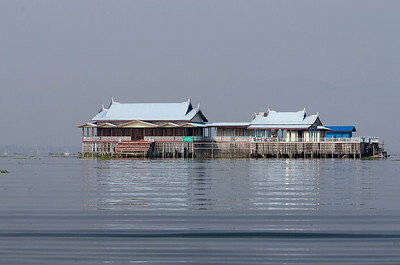 This unique style evolved out of necessity as the lake is covered by reeds and floating plants, making it difficult to see above them while sitting. 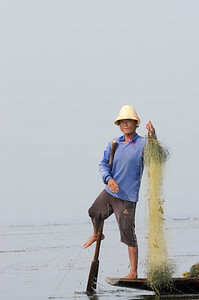 Standing provides the rower with a view beyond the reeds. 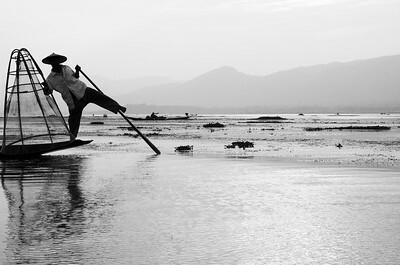 However, the leg rowing style is only practiced by the men. 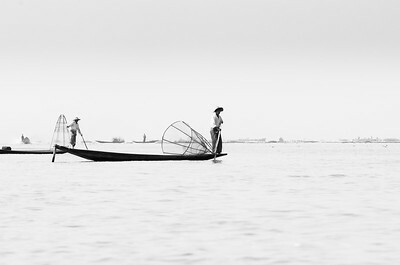 Women row in the customary style, using the oar with their hands, sitting cross legged at the stern.